In my quest to examine different religious movements, I now come to the Mennonites, who are actually a branch of the Anabaptists. The Anabaptists tended to be hated by both Catholics and Protestant reformers because of their unorthodox views. The main one was that they baptized adults rather than infants, but they also believed in pacifism, not taking oaths, and refusing to participate in civil government. 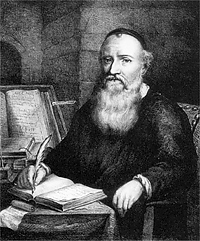 The Mennonites in particular were named after Menno Simons, a sixteenth-century Dutch priest who rejected Catholicism and embraced the unpopular Anabaptist movement. The devotion of the Mennonites to pacifism was even greater than that of their fellow Anabaptists. It’s also said that Simons taught that Jesus did not receive flesh from his mother, but I don’t think that’s an important doctrine for the Mennonite Church as it developed. Mennonites do emphasize simple living, charity, honesty, social justice, and a sense of community. Fleeing European persecution, many Mennonites fled to Russia and North America. The Amish are sort of an offshoot of the Mennonites, but not exactly, and started in and around Switzerland. Their founder, Jakob Ammann, took issue with the Mennonites of Switzerland for not being disciplined enough, which just goes to show that there’s no radical movement that won’t eventually spawn an even more radical movement. And the Amish only became more radically conservative over time, rejecting most new technologies and sticking to their traditional way of life. If Wikipedia is correct, the Amish sect is pretty much totally dead in Europe, aside from a small congregation in Ireland. Most of the followers of Ammann’s views ended up moving to North America, where their descendants still remain today. Not all Amish communities survived, but the ones that did are known for their black clothes, long beards with no mustaches (well, on the men, anyway), one-room schoolhouses, travel in horse-drawn buggies instead of cars, and, above all, their general withdrawal from the larger society. To the Amish, remaining separate maintains their humility and opposition to comfort, which they think God desires. I’ve never quite understood the idea that God wants people to suffer; isn’t that supposed to be what the Devil wants? I remember learning about the Amish way back in second grade, and thinking their lives seemed pretty bleak. I guess it’s different when that’s the only way of life you know, though, and at least they probably don’t have as much of an income gap as the rest of us do. Actually, I grew up about thirty miles from Lancaster, Pennsylvania, where there is a a particularly large Amish community, as a subset of the Pennsylvania Dutch culture. Despite their name, the Pennsylvania Dutch aren’t really from the Netherlands, but from Germany and Switzerland. They’re just called “Dutch” because they each pay their own way when eating at restaurants. No, seriously, I think it’s a corruption of “Deutsch,” which of course is German for…German. A few years ago, I saw a documentary called Devil’s Playground, which described the period known as Rumspringa when Amish teenagers are allowed to explore the world outside their own community. And when they explore the outside world, I don’t just mean they try to find out what the big fuss is about TV. Apparently a fair number of them get involved in heavy drug use. The basic idea is that the teenagers are supposed to decide whether or not to become members of the Amish Church (since, as was already established, they don’t practice infant baptism), but I have to suspect most of them don’t have anywhere else to go, and hence are probably trying to get the crazy behavior out of their systems before returning. The documentary actually made it look pretty easy for people who leave the Amish community to get jobs and homes, but it wasn’t looking at a representative sample. Another thing that bugs me about the Amish is their general disrespect for animals, which can be partially seen in the fact that they still make horses pull their vehicles. Hey, dudes, if you want a simple vehicle, how about a bike? I’m not as extreme in my views as Nellie McKay and her condemnation of horse-drawn carriages, but the buggies do kind of strike me as unnecessary. Also, the Amish have been known to be affiliated with puppy mills, and Beth saw a lady at the Amish farmers’ market down the road let a puppy fall on the floor. I guess it’s a little weird to me because I usually think of a simple life lacking in modern conveniences as going hand in hand with close communion with nature, but apparently the Amish want none of that, at least not when it comes to any part of nature that walks on four legs. They do make good stuffed pretzels, though. This entry was posted in Amish, Anabaptists, Christianity, Germany, Historical Personages, History, Mennonites, Religion, Switzerland and tagged devil's playground, jakob ammann, jesus, menno simons, pennsylvania dutch, rumspringa, virgin mary. Bookmark the permalink. I think I’ve seen Devil’s Playground before, and I know I’ve definitely seen similar documentaries on the Amish. MTV even had a “True Life” episode called “I’m used to be Amish”–about teens and young adults going through their Rumspringa or those who have already left the community, naturally. I get the feeling that the Amish community, while never that large, is going out of existence. It seems like more and more post-Rumspringa teens decide to never come back to the Amish lifestyle. Some of them still live on farmland or near their old home, of course, but I think a lot of them move to urban areas. I noticed too that the Rumspringa doesn’t just involve heavy drug use, but also holding underground (as in illegal) raves in abandoned barns. Like they’re really, really into the rave/clubkid scene during the Rumspringa. Dunno why, but I guess it’s a way of doing the complete opposite of their religion’s dogmatic beliefs. I’m kind of surprised the Amish have lasted as long as they have. I guess if they really want the new generation to stick with the community, they shouldn’t let them see the outside world at all. But then, as far as I can tell, it’s only tradition that’s keeping the Amish in their current position. It’s not like there’s some kind of Amish Mubarak or Gaddafi standing in their way, right? 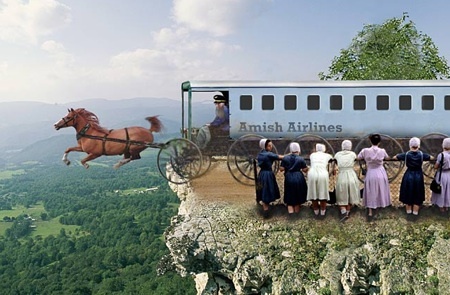 Another problem for the Amish community is how inbred it’s become over the years, what with the shrinking population. As for the rave, I guess it’s hard to get any farther from the Amish lifestyle than drugs, dancing, AND electric lights. The Amish are actually one of the fastest-growing populations in the world. They have huge families and actually only a very small number (around 5% I think) of teenagers don’t join the church after rumspringa. Also most of them don’t get into drugs, drinking etc – these documentaries tend to show only the wild side. Typical rumspringa activities might be going to a singing hosted by the church or going out for a buggy ride with the girl you’re courting. Also living simply really isn’t suffering. :o) We plain people just tend to have a different set of values from most. But we’re happy! 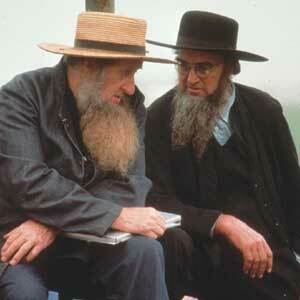 You started talking about Mennonites, and that is my heritage. I grew up speaking Platt-Deutsch, a dialect that has more in common with Dutch than German (have travelled to both Holland and Germany and felt more at home in Holland with the Dutch language). Most Canadian Mennonites of my parents’s generation (now in early 80’s) spoke that at home and learned “High German” at school and church. There are “57 Varieties” or more of Mennonites now, ranging from the liberal General Conference Mennonites to the warm-hearted Mennonite Brethren or missions-minded Evangelical Mennonite Mission (the church I grew up in) to the Barchtolle (fairly conservative but great singers) to the Old Colony (many of my relatives grew up in the that one and they kept to themselves in small autonomous villages). This is just Mennonites, not Amish, and not Dukabors, who are a whole ‘nother story. Western Canadian Mennonites have relatives in Mexico, Paraguay and Uruguay. Eastern Canada and eastern US Mennonites seem different and are more like Pennsylvanian Dutch who would be the bridge community between Amish and Mennonites. While I no longer attend a Mennonite church, my Christian faith is still strong, and I do believe the Anabaptist way of baptism, even though I am a “heretic” in the Lutheran church I now attend. My ethnic heritage is Mennonite, which in my family means that I can trace my ancestors to Holland on both sides of my family. To me it means good food, great cooking skills, conservative viewpoints, small world view, but a family community if you need it. 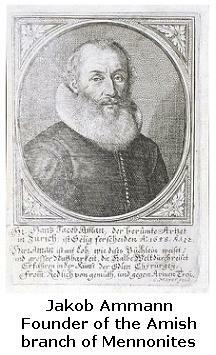 My siblings try to play it down,and call themselves German, but Menno Simons started the movement in northern Holland. Amazingly enough, my childhood dialect is somewhat similar to Yiddish…..go figure.